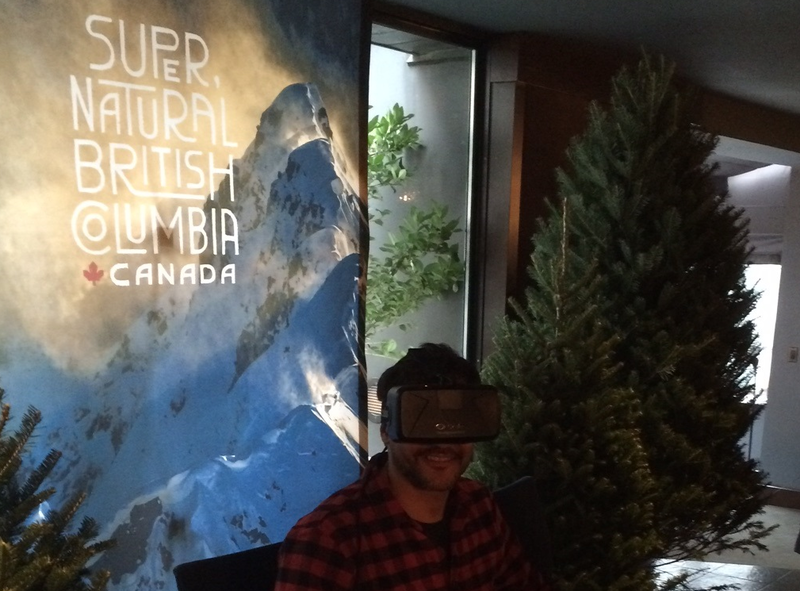 Author tries Oculus Rift headsets for VR view of British Columbia. 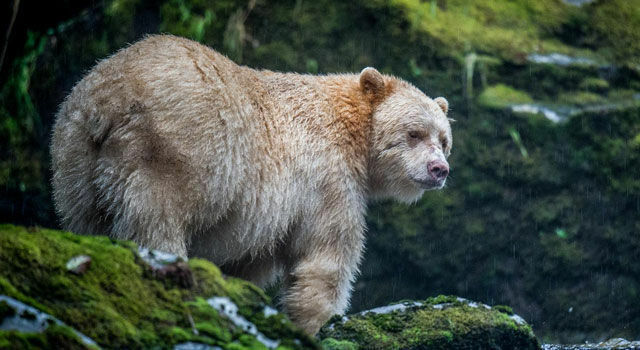 This December, I was able to take part in the Wild Within, Destination BC’s virtual reality experience used to promote travel to British Columbia. As pioneers in the use of this technology, I was curious to see what this innovative marketing team had come up with to tantalize tourists. Upon arriving at the penthouse of the Royalton Hotel in New York, I was greeted by Janice Greenwood and the rest of the friendly Destination BC team. They had set up the hotel room to resemble a warm winter cabin complete with a cozy fireplace and s’mores. In the center of the room was a table with two Oculus Rift headsets on it. I was very excited to try out the Oculus Rift as I had heard many stories about how real this VR experience was compared to others. While the tech geek in me was ready to see if the frame rate and high resolution would hold up as well as I had read about, the creative in me was anxious to see how Destination BC would use this technology to show me — a potential traveler — British Columbia. Before sitting at the Oculus Rift, I sat down to watch a five-minute HD video highlighting different destinations in British Columbia. The video was full of stunning images from the deserts in Osoyoos, to the vineyards of Oliver. Accompanied by a proud Canadian voice was beautiful footage of majestic redwood trees and large plains full of wild horses. My only travel experience in BC had been Vancouver (one of my favorite cities in the world). I had no idea how much there was to do and see there. After watching the initial video, I was ready to book my ticket. And, I was even more curious about what I was about to experience with the Oculus Rift. The headset fit comfortably and was lighter than I expected. Even after I put on the additional headphones (the Oculus Rift headset does not have audio built in), it was easy to move my head around. I never felt that the wires connecting the headset to the laptop that the VR program was being run on restricted my movement. Once the heaset was on, I felt as though I was staring at two screens placed directly in front of my eyes, but as soon as I turned my head around to the left and right, I felt truly immersed and forgot about the technology. It was pretty amazing. In the virtual world, I was greeted by a tour guide on a small boat. As we started our journey, I was asked by the guide if I would like to head through the alpine or go along the coast and see some sea lions. I thought it was clever to add a bit of interactivity for the viewer right at the beginning. It added to the feeling of actually being in this virtual world. Traveling up the coast in the Oculus Rift was fantastic. I could turn my head 360º and see everything around me. In technical terms, the frame rate of the goggles was perfect; there was no lag as I turned my head. Even though the edit had noticeable cut points (there were a few times where we went from first person view in the boat to an overhead wide shot), I never had the feeling that I was just watching video being played on a screen. As I looked into the nearby water, I could see the sea lions swimming alongside the boat. At one point, a flock of birds passed right in front of me. There was plenty of depth and paralax in the footage that was shot. It was like watching an iMax movie that was being projected 360º around me. The frame rate of the Oculus Rift kept me from feeling queasy, and made the VR feel very natural. The experience I had was based on where I chose to look at any given time. It was truly unique to anyone else’s. When my tour ended I found myself wanting to try it out again, just to see all of the things that I possibly missed my first time around. The only thing that kept me from being totally immersed in the VR experience was the lack of wind touching my face and the missing smell of the river as the boat cruised up the coast. I think that using this VR technology to promote a destination is a wonderful idea that can work very well. The production of the Wild Within VR Experience was very well thought out, and executed the right way. As an avid traveler, I hope that this kind of “pre” travel experience becomes the norm. I look forward to my next visit to British Columbia … there is so much more to do than I had ever imagined. …Oh, and the s’mores were delicious!